When ghosts and ghouls are pounding pavements trick or treating, Halloween can seem a blur! Between face paints, costumes and carving, we round up our top five simple Halloween craft ideas for kids. An egg box, black poster or acrylic paint, paintbrush, scissors, googly eyes, glue or double-sided tape, string, ribbon or elastic. Not blind as a bat! Some bats can see as well as humans! So ‘blind as a bat’ doesn’t fit all our flapping friends. However, at night, their ears are more important than their eyes – they use a special sonar system called ‘echolocation’ to pinpoint objects using echoes. So when they fly at up to 60mph, it’s unlikely you’ll face a head on collision. Phew! Boo! 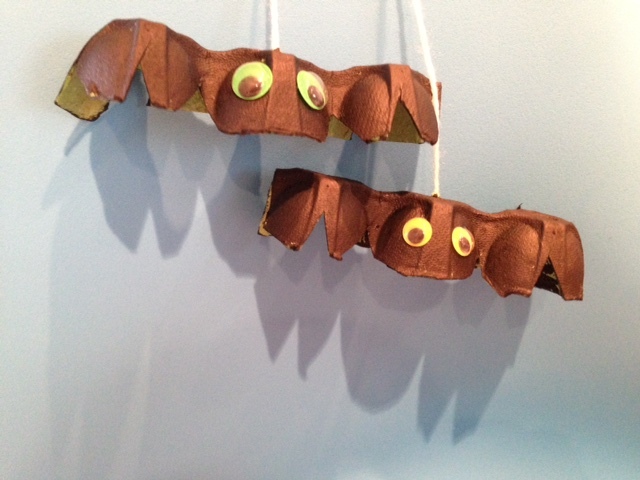 Wingston the chocolate bat, Witchney and Cryptopher the vampire haunt our Boo! Box Halloween chocolate collection. Wingston’s wings flap out, making an instant, extra Halloween decoration. Keep your doors closed though, he’s prone to take to the skies. Black cardboard, white wool, googly eyes, glue or double-sided tape. Leave a space to glue the two googly eyes in place. From ancient Egypt direct to your door. Warning: may attract trick or treaters. 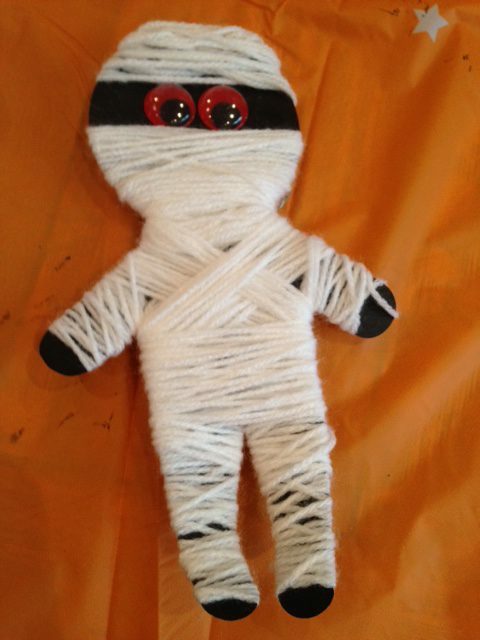 The English term mummy is derived from the medieval Latin word mumia, which in turn comes from the medieval Arabic word mumiya and Persian mum (wax). So there you go, all wrapped up. 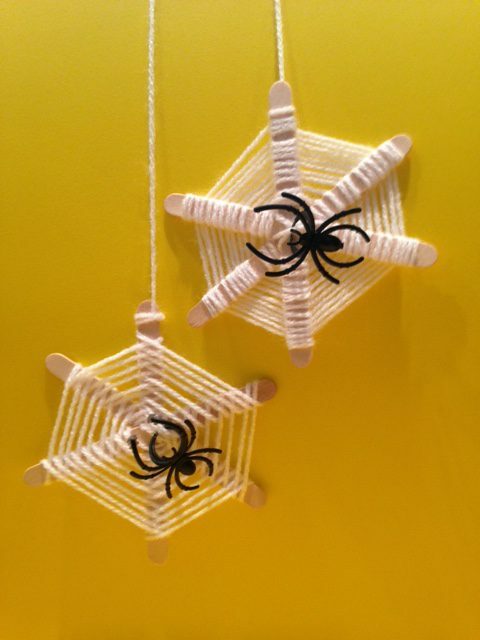 Wood craft sticks (look like ice lolly sticks), craft glue, white wool, plastic spiders (you may find a few in the cupboard from last Halloween). The perfect catch for Halloween windows. Apples, paper (black or white), orange, green and black poster or acrylic paint. 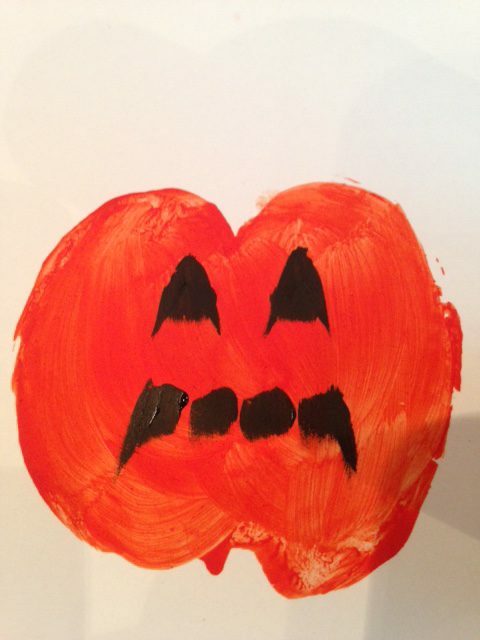 Super-easy alternative: Draw pumpkin faces on clementines. All you need is a black, permanent felt marker. Advantage: you can always eat them if you make a mistake! That apple you crunch through is 25% air, which explains why they rise to the surface of water. If an object is less dense than water, it floats. Which is why apples ‘bob’. Where does ‘pumpkin’ come from? A seed, yes, but the name pumpkin comes from the Greek word ‘pepon’, meaning ‘large melon’. Large, and very round! Perfect on your patch: pumpkin pie isn’t to everyone’s taste. 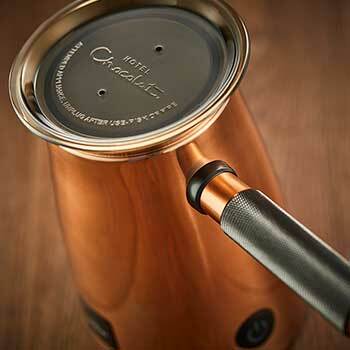 The Yumpkin 40% milk chocolate pumpkin is a real treat, made with more cocoa, less sugar. If it lasts to Halloween, also makes a great decoration! 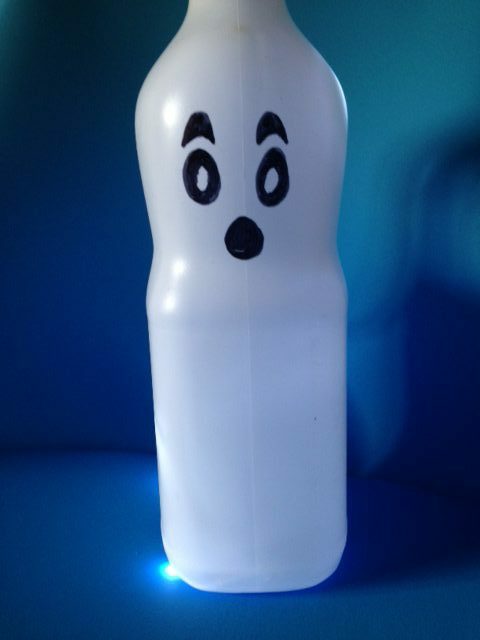 Two or four pint clean, empty plastic milk bottles, LED fairy lights, permanent black marker. The simplest and possibly most effective of them all. We love these on doorsteps at Halloween. Draw your spooky expression in marker and wait to dry. When it’s dark outside and you’re ready to haunt, simply switch on the LED fairy lights and place them in the bottle. Eerie and effective. In Covent Garden plays have been produced for over 300 years. It seems in Drury Lane ghosts also want to tread the boards. The most famous is the ‘Man in Grey’ a nobleman carrying a sword. True or just an act? Who’s looking at you? Spooky. You can’t escape the stare of our Oozy Eyes, one bite and they drip molten red caramel. Fabulously gory, gorgeous eyeballs. Want a crafty pick-me-up? Fiends are afoot in our Halloween chocolate collection, keep your spirits lifted while you’re busy with the glue and scissors. Share the spooky results or your own decoration tips on Facebook, Twitter and Instagram.